Hey guys, this is a crosspost of a thread from Pixeljoint. I am posting it here in hopes of receiving additional feedback. I have another version of this at home that I plan to upload later tonight. I would do it now, but I am on a school computer and don't have the file. If your platforms are going to be that large, I'd add some interest in the center - maybe little holes with flowers or just some rocks. Those are really large areas of flat brown in the center. I am working on adding some stuff to break up the monotony a little bit, though it will be a while until there is enough to be sufficient. I adjusted the colors of the grass a bit to see if that helps too. What if you did something like this with your colours and just made everything generally a bit more vibrant and darker? That's an interesting take on it, but I am going for a different aesthetic with warmer colors, so I don't think I will take that path. I quite like the aesthetic you've got going on here so far, bright and moody at the same time. Interesting. More tiles. 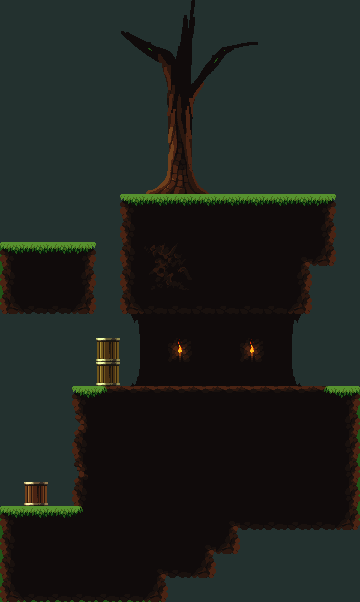 Edited the colors a bit, and added more variations of tiles. More stuff. I tried to fix the grass a little bit and make the tunnel backdrop more separated from the foreground. I'm probably going to need to remake the rocks and long grass. You're doing really well imo I like the faded colour of the cave background. can I suggest to tone down the saturation of the background colour its a bit off-putting. I like the variation in the grass by adding tufts. I suggest for the longer grass don't use the brightest green much/at all because it gives it too much priority inferring its interactive/solid.